David Angus uses the four Gospels of Matthew, Mark, Luke, and John to craft this in-depth biography of Jesus of Nazareth. 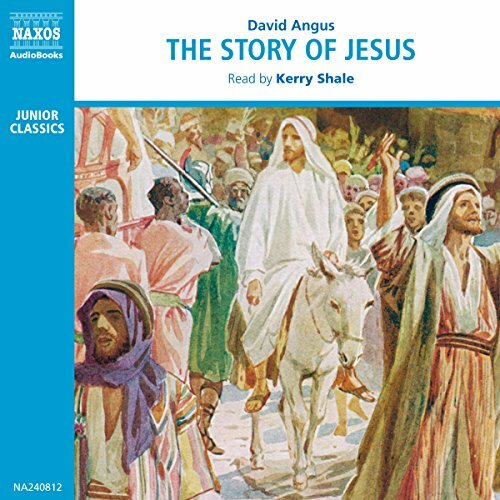 Using the New Testament as his source material, Angus describes Judea before Jesus, and relates the famous stories of his birth and baptismal, the miracles and messages of love, his betrayal by Judas, and his crucifixion, all intoned by Teresa Gallagher in a sympathetic and euphonious performance. Gallagher's pleasant style fits The Story of Jesus, which provides a complete and efficient chronicle for listeners interested in the story of Jesus but daunted by the sheer volume of the Bible. The story of the life of Jesus of Nazareth is told in the first four books of the New Testament of the Bible: the Gospels of Matthew, Mark, Luke, and John. The word "gospel" comes from old English, and means the "good story". The Gospels portray Jesus as both a healer and a teacher. They describe him performing miracles and they tell his words. The men who wrote these books believed that Jesus was the Messiah: the great leader promised in the ancient Jewish prophesies of the Old Testament. They said that he was the Son of God, that he died on the cross to redeem the sins of mankind, and that he rose from the dead after his crucifixion. Today Jesus' message of love and forgiveness, and the drama of his life, continues to inspire people to find new ways in which to tell the "good story". This version of The Story of Jesus is read by a British narrator, Teresa Gallagher.